This site has been set up in order to perpetuate the activities of an FTP underground movement (we will refer to it here as the Maquis) that operated in the valley of Aude, during World War II, and to pay homage to U.S. Lieutenant Paul Swank and the partisans who were killed by the Nazi cruelty. This site features documents, stories, testimonies, records (archives) and photographs. The major part of this site contains stories and testimonies of former partisans who are now 80 years old and older! The photographs come from private and personal collections. This collection pays homage to all these men who sacrificed their youth for the sake of France. Inevitably and despite all our efforts some mistakes will be made in a work of this nature and we hope to amend these as soon as possible. 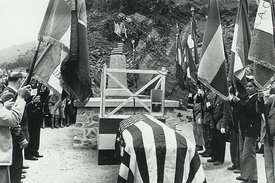 Every year, the association perpetuates the memory of its members by organizing two ceremonies: one in July, at the monument in Salvezines and also in the Resclause forest by the memorial plaque, another ceremony on August 17th in the Alet Pass, at the tomb of Lieutenant Paul Swank of the US Army.